This is a serious page on Roman coins, weights and measures. If you are looking for the Colosseum on coins click here. were the as, made of copper; the sestertius, the quinarius, the silver denarius and the golden aureus. 1. The as, the unit of the Roman currency, was originally one pound of copper, but its value diminished with time till at last it contained only 1/24 of a pound. Note: An as, whatever its weight, was always divided into twelve unciae. 2. The sestertius contained originally 2 1/2 asses, the quinarius 5, and the denarius 10; but as the as depreciated in value, the number of asses in these coins was increased. a) In Weight, the as is one libra, or pondo, which means "weight" (~ 327 g), and the uncia - one ounce - is 1/12 of the as (~ 27 g). b) In Measure, the as is a foot - 29.6 cm (11.6 inches) - and the uncia is 1/12 of a foot (24.6 mm). c) In Interest, the as is the unit of interest -- i.e., 1 percent a month or 12 percent a year; the uncia is 1/12 percent a month, or 1 percent a year; and the semis is 6/12 percent a month, or 6 percent a year, etc. d) In Inheritance, the as is the whole estate, and the uncia 1/12 of it. Hence heres ex asse, heir of the whole estate; heres ex dodrante, heir of 9/12. Now, why dodrante? It is the ablative case of dodrans, dodrantis (masculine), that is a mix of de and quadrans, and that means "missing 1/4 of the unit". The unit is the as so here it means "owner of 3/4", that is the same of 9/12. Dodrans could also be a measure of length (3/4 of a foot): "quinque pedes et dodrans" and of time: "dodrantes horarum", i.e. 3/4 of an hour (which in any case had a very different length then). A nice page on Roman units of measure is of course in Wikipedia. ducenti sestertii = 200 sestertes. b) One thousand sesterces are denoted by mille sestertii, or mille sestertium. quinque milia sestertium, or quinque sestertia = 5,000 sesterces. Note.--With sestertia the distributives are generally used, as -- bina sestertia. vicies sestertium, 2,000,000 (20 x 100,000) sesterces. In the examples under d), sestertium is treated as a neuter noun in the singular, though originally it was probably the genitive plural of sestertius, and the full expression for 1,000,000 sesterces was decies centena milia sestertium. The words centena milia were afterward generally omitted, and finally sestertium lost its force as a genitive plural, and became a neuter noun in the singular, capable of declension. 2. Sometimes sestertium is omitted, leaving only the numeral adverb: as, decies = 1,000,000 sesterces. 1. The Libra, also called As or Pondo, equal to about 11 1/2 ounces, is the basis for Roman weights. a) The libra, like the as in money, is divided into 12 parts. 2. The Modius, equal to ~ 8 2/3 of a liter (about a peck) is the basis for dry measure. 3. The Amphora, containing a Roman cubic foot, equivalent to about seven gallons, is a convenient basis for liquid measure. 4. The Roman Pes or Foot, equivalent to about 29.6 cm (11.6 inches) is the basis for length measure. The sestertius (Eng. sesterce> sehs-tursh) was the main coin used for setting prices and values. The word is formed from semis-tertius = 2 1/2. Also, as aureus, denarius, and other coin names, the name was originally an adjective modifying nummus, the Roman word for "coin". Before the Second Punic War the sestertius was worth 2 1/2 asses because this was a convenient value, since 10 asses = 1 denarius. Early in the war due to hard times the as was devalued to 4 asses = 1 sestertius, which made 16 asses = 1 denarius. A man in the times of Augustus was considered to be part of the equites (knights, rich class) if he possessed 400,000 sesterces (100,000 denarii) worth of property. Under Augustus, a senator had to own property equal to 1,000,000 sesterces (250,000 denarii). A common soldier under Augustus and Tiberius (ca. 15 A.D.) made about 10 asses per day (less than one denarius) or about 900 sesterces per year, and under the emperor Domitian (ca. 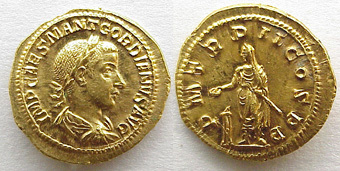 85 A.D.) this had only raised to about 1,200 sesterces (300 denarii) per year. Praetorian legionaries (an elite force) under Augustus received 2 denarii per day or about 730 per year. Officers of course could expect more- centurions (perhaps equivalents of modern sergeants) received 3750 denarii per year under Augustus and 5000 under Domitian. A lawyer under Claudius (ca. 50 A.D.) could expect his clients to pay up to 10,000 sesterces for his services in a case. Juvenal (ca. 100 A.D.) complained of charioteers who made 100 times what a lawyer did- 15,000 to 60,000 sesterces for one victory, and Martial, who wrote in the latter half of the first century A.D., talked of a charioteer named Scorpus winning 15 bags of gold in one hour. Another charioteer living under Hadrian and Antoninus Pius (ca. 140 A.D.) was supposed to have made 35,863,120 sesterces in his life. Martial also wrote of a slave who cost 100,000 sesterces, and he made fun of patrons who could offer no more than 100 quadrantes (6 1/4 sesterces) to their sicophants as a day's gift. In another place, he basically says he would have sold his loyalty to a man named Paetus for 6,000 sesterces, except that Paetus paid him too late. 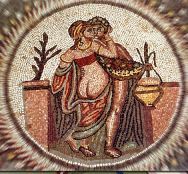 In the first century A.D., olive oil cost about 2 or 3 sesterces per quart, and wine between 1 and 4 asses per pint. A trip to the public baths cost about 1 quadrans for a man and 2 quadrantes for a woman, children got in free- of course, you had to bring your own servant, oil, and strigil (instrument used for scraping away grime). A lonely man in Pompeii reported paying a denarius for a good night with a woman. A town house in Rome might cost between 500,000 (125,000 den.) and 2,500,000 sesterces (625,000 den. ), and a iugerum (slightly more than 3/5 acre) of land might cost between 1,000 (250 den.) and 12,000 sesterces (3,000 den.). When used to describe large amounts of money the sestertius was often counted in milia(1000s), so they used the genitive plural of sestertius, but since sesterti*orum is so long they shortened it to sesterti*um. That is one explanation. Another says that sestertium is just the adjective form modifying mille-- in which case you would expect milia sestertia, and this does appear sometimes. So if we are confused about this, it seems the Romans were too. Soon sesterti*um (the genitive plural form) came to understand mille (1000) or milia and sometimes (but rarer) to understand centum milia (100,000). Using sesterti*um this way, the Romans added a distributive adjective like decie(n)s (x10) or millie(n)s (x1000). vicie(n)s sesterti*um = 20,000 sesterces; or (rarely) 2,000,000 sesterces. Now that I've showed the thoroughly confusing Roman longhand for monetary amounts, I will describe their shorthand notation. HS stands for sestertius. The H was originally II, and the S stands for semis (n.b. II (2) + semis (1/2)). To indicate 1000 sesterces they wrote HS with a line over it. To indicate 100,000 sesterces they wrote HS with a line on top and on each side. They used this same technique with other quantities. So HS followed by XV with a line above the XV indicated 15,000 sesterces, and HS followed by XCI with a line above and at each side of XCI indicated 9,100,000 sesterces. Values before the Second Punic War, 218 B.C. 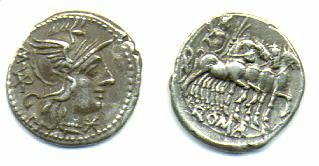 The siliqua is the modern name given to small, thin, Roman silver coins produced from 4th century and later. The term siliqua comes from the siliqua graeca, the seed of the carob tree, which in the Roman weight system is equivalent to 1/6 of a scruple (1/1728 of a Roma pound or about 0.19 gram). Are called siliqua various silver coins on the premise that the coins represented that were valued at 1/24 of the gold solidus (which weighed 1/72nd of a Roman pound) and therefore represented a siliqua of gold in value. Since gold was worth about 14 times as much as silver in ancient Rome, such a silver coin would have a theoretical weight of 2.7 grams. However, the term seems to be one of convenience as no name for these coins is indicated by contemporary sources. Thin silver coins to the 7th century which weigh about 2 to 3 grams are known as siliqua by numismatic convention. This set maximum prices for which goods could be sold. For the first time, a hoard of Roman gold coins has been discovered in London. At Plantation Place in the City of London, Museum of London archaeologists excavated 43 coins from a possible masonry-lined deposit box under the floor of a substantial Roman London residence. The coins were probably held in a textile or leather purse inside a small wooden box. The Romans introduced a currency system into Britain based on three metals: the aureus of gold, the denarius of silver and lower denominations of copper alloy. This valuable hoard consists solely of gold aurei, coins never in everyday circulation but used by administrators, bankers or rich merchants. Although it spans more than 100 years (from AD65-174), the hoard is thought to be a random selection of coins likely to represent the owner's savings, deposited in a safe place but never retrieved.